video with many thanks to YNUKtv. So far there are marches and protests almost everywhere in the country and more and more unions have balloted members and are joining this protest which will be the biggest general strike ever seen in the UK. 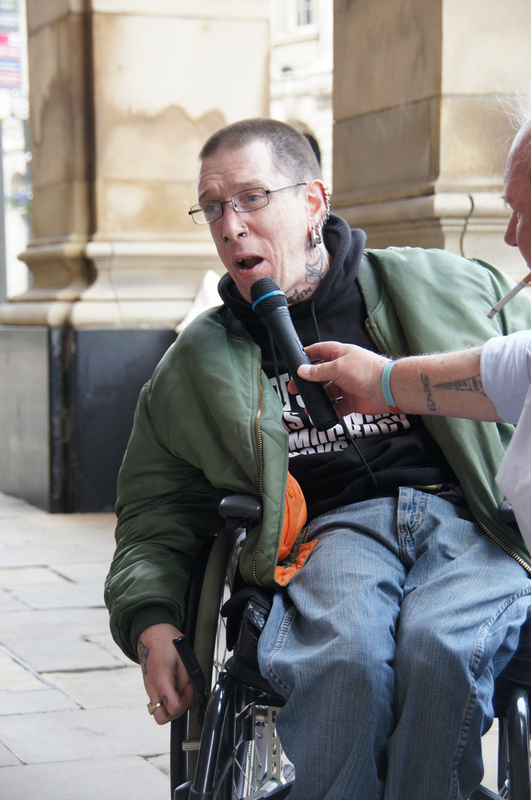 Over 3 million trade union members are going to be on strike, including disabled members. This is not just about public sector pensions although that is the only thing unions can legally take strike action about: it is a fight to save the welfare state that we all need, to stop the Condems destroying our NHS, and our lives. Although you may feel this doesn’t involve you if you’re not a union member or aren’t working it is all very much part of our continuing fight for justice for our community so we would urge anyone who can to take part in these events on November 30th. John Mc Donnell said at our conference that it would be great to have a disabled person on every picket line in the country. 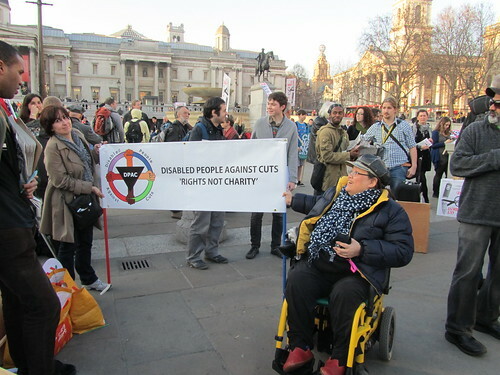 We agree and we need to be seen to be part of this so that we and our fight keep being visible to non-disabled people and trade union leaders. Barnsley – 10am, demonstration in Churchfield road, S70 2JT. 10.30am, rally at YMCA, Blucher Street, S70 1AP. Bathgate – 10am-2pm rally at Fairway Hotel, EH48 1BA. Belfast – noon, four feeder marches assemble at: Central Railway Station, Bridge Street, BT1 3PB; Mater Hospital, Crumlin Road, BT14 7AB; Royal Victoria Hospital, Grosvenor Road, BT12 6BA; City Hospital, Lisburn Rd, Belfast, County Antrim BT9 7ER. They will march to a rally at 1pm at Belfast City Hall, Donegall Square, BT1 5GS. Bolton – 11.30am, rally at Victoria Square, BL1 1RU. 12.30pm march to Derby Ward Labour Club, Deane Road, BL3 5AH, for rally at 1pm. Bradford – 11am, rally at Centenary Square, BD1 1HY. Brighton – 11.30am, assemble at Victoria Gardens, BN2 1UG. March to The Level, BN1 4SB, for rally at 1pm. Bristol – 11am, assemble at College Green, BS1 5TA. March to Castle Park, Castle Street, BS1 3XD. Cardiff – noon, assemble at Cathays Park, CF10 3AT, for march to a rally at 1pm at the SWALEC stadium, Sophia Gardens, CF11 9XR. Chester – noon, assemble at Castle Drive, CH1 1SL for march to Guildhall, Watergate Street, CH1 2LA, stopping at the Chester Cross junction, CH1 1PD, at 1pm for a protest. Derby – Silk Mill 11.15am march to Market Place for rally at noon. Hastings – 11.30am, assemble at Hastings Pier, 34 White Rock, TN34 1JY, before marching to the Town centre. Rally, to take place after the march, in Robertson Street, TN34 1H; between Debenhams and the Havelock public house. Huddersfield – 10.30am, assemble at St George’s Square, HD1 1JA, march around the town centre followed by a rally. Motherwell – noon, rally at North Lanarkshire council building, Windmillhill Street, ML1 1AB. Nottingham – 12.30pm, rally at The Albert Hall, North Circus Street, NG1 5AA. 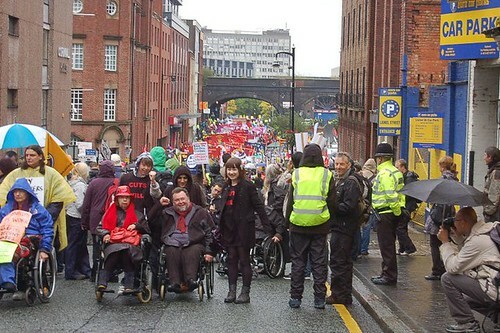 Salford – 11.30am, assemble at Bexley Square to march to rally in Manchester. M3 6BZ. Sandwell – 10.30am outside Sandwell Council House, Oldbury. York – noon at Tower Gardens, opposite Clifford’s Tower, march to York Minster for 1pm rally with union and service user speakers. Right to Work – Volunteers needed! Over 800,000 trade unionists are set to strike next Thursday in the biggest confrontation with the government so far. The country will be awash with picket lines and protests, see the battle map on the Right to Work website for more information. We are urging all our supporters to visit picket lines in solidarity, take breakfast, take banners, etc. We are looking for activists who can volunteer between now & the 30th June to help with stalls, campaigning, placard & banner making. If you are able to offer your time please get in touch. We will be running campaign stalls at major demos across the country, see the battle map for protests & contact us on 07961 337 640 or 07749 481 600 to volunteer or be put in touch with the Right to Work group in your area. We have over 50 rallies and demonstrations on the Battle Map now. Please send in any action you are taking. We will have a slideshow of pictures from the pickets, rallies and demonstrations on our front page. put a title in the subject line and then “tags:30june” – this will drop it automatically into the slideshow on the website. Please send reports from your picket lines, protests etc to reports@righttowork.org.uk and we will add then as fast as we can! Kevin Courtney Deputy General Secretary of the NUT, John McDonnell MP, and PCS General Secretary Mark Serwotka were the headline speakers. 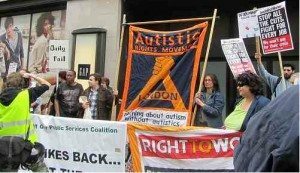 Striking lecturers, disability campaigners, Black Activists Rising Against Cuts, young teachers and anti cuts activists spoke at a 850 strong rally in the Friends Meeting House in Central London on Wednesday. The event had an electric atmosphere. On 5th July it will be 63 years since the NHS was founded. It’s even more important to mark the birthday of Britain’s most popular institution this year, as we face the potential dismantling of the NHS in the form of Andrew Lansley’s Health and Social Care Bill. The NHS is working: Public satisfaction with the NHS is at an all-time high. Doctors, nurses, midwives, support staff, patients groups and more have all spoken out about the dangers of these changes. Right to Work calls on all anti cuts campaigners to make sure that wherever the ConDems go they are hounded. The latest national union to affiliate to Right to Work is the Bakers, Food and Allied Workers Union. Speakers: John McDonnell MP, striking Camden & Tower Hamlets teachers, Tower Hamlets council workers & UCU lecturers. Roger Lewis of Lambeth DPAC will be speaking for us. 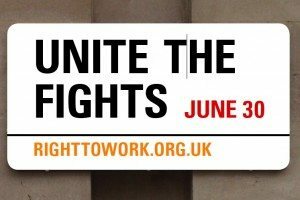 On Budget Day, 23 March, Right to Work is calling for nationwide protests against Osborne’s cuts and to build for 26 March. DPAC will be attending. In London Right to Work and the Coalition of Resistance are jointly organising a protest – assemble 5pm Trafalgar Square to march to rally outside Downing Street. “We believe that ordinary people should not have to pay for a crisis caused by the bankers and the corporate hyenas. 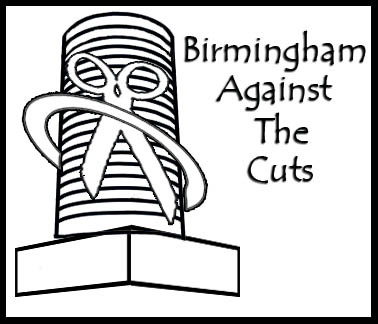 We reject Osborne, Cameron and Clegg’s austerity programme and cuts. Accordingly on Budget Day, 23 March, we agree to sponsor and support the protest called by the Right to Work Campaign and the Coalition of Resistance – assemble 5pm in Trafalgar Square for a march to a rally opposite Downing Street. 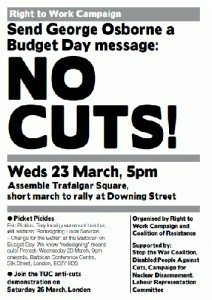 London Budget Day Protests: 23rd March! On Budget Day 23rd March in London Right to Work has initiated two protests. In the morning the Tory in charge of cuts, Eric Pickles, Secretary of State for Communities and Local Government will address the ‘Redesigning Local Services – Change for the Better’ at the Barbican Centre in the City of London on the morning of Budget Day, Wednesday 23 March. 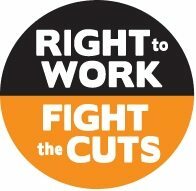 Right to Work is calling a protest from 9am onwards and invites all of those opposed to cuts to come along. At 5pm we are asking people to assemble at 5pm in Trafalgar Square to march to a rally outside Downing Street at 6pm. This is organized by RtW and the Coalition of Resistance supported by Stop the War, Labour Representation Committee, CND & DPAC.